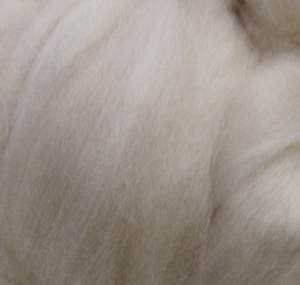 ﻿ Mongolian Cashmere Merino Fibers from Weaver Creek Fibers, wholesale purveyors of luxury fibers. Our 50/50 blend of Mongolian Cream Cashmere and Superfine Merino is a terrific compromise for the fiber artist who wants the look and feel of the 100% cashmere, without the higher cost. The blend takes color beautifully and blooms with that special cashmere quality. We recommend a tight twist, when spinning, giving your yarn a lot of bounce and durability, while allowing the bloom to emerge for the end user. Our cleaned, dehaired and combed Mongolian Cashmere Merino top is available in cream. The staple length is 2.08 inches (52mm) and has an approximate micron of 16. It is also available blended with Merino/Angora.